The Friends of Mike Freer: Yet again Mike leads the way ! It seems that Barnet is at last getting the respect it deserves under Mike Freer's leadership. It seems that even Hazel Blears is a big fan of Mike. She's been paying tribute to the innovative Future shape scheme, and has been praising Barnet for its pioneering and innovative approaches taken to involve local residents in shaping policy across the borough. The use of social networking sites such as Youtube and Facebook, along with informal neighbourhood meetings known as Leader Listens are cited as improving dialogue with local people to give them a direct input into improving local services. Clearly Ms Blears doesn't fully understand how this wasteful scheme operates in Barnet. How it excludes the local Councillors she champions in her work and how half of local residents are barred from placing comments on the blog. Maybe you can update your post to show a list of the changes to Barnet's policies that you claim this expensive gimmick has changed? 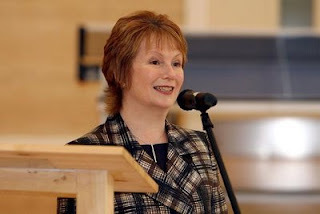 Hazel Blears is one scary woman but praise where praise is due. I got a pothole sorted in my road after attending one of the meetings. Always great to meet another friend. Great blog ! I see the muppets are still there!